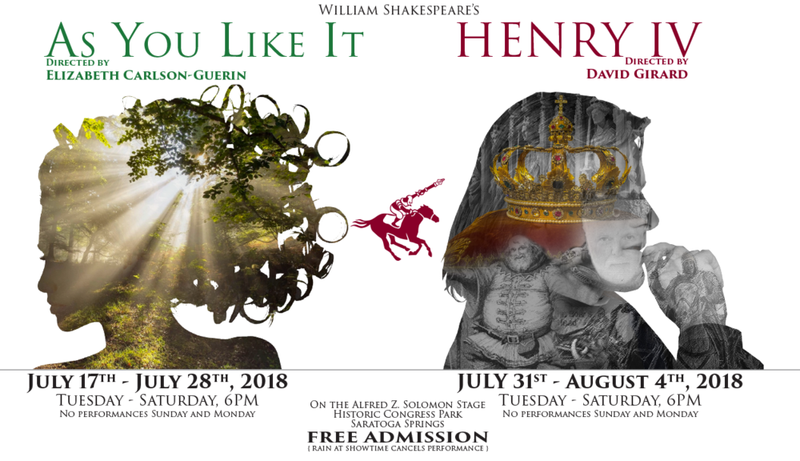 The Saratoga Shakespeare Company once again presenting two summer productions: Shakespeare’s As You Like It directed by Elizabeth Carlson-Guerin, and Shakespeare’s Henry IV, Parts 1&2 (combined), directed by David Girard. This is a Season of Transformation, and our company is thrilled to celebrate its eighteenth summer season of free outdoor theater in beautiful Congress Park in downtown Saratoga Springs, NY. As always, all performances will be in Congress Park, Saratoga Springs, on the Alfred Z. Solomon Stage, at 6PM. Admission is always free of charge, and Congress Park is entirely accessible. Both young and old, as well as family groups, are strongly encouraged to attend – with or without picnics – for what has become a beloved summer tradition in Saratoga. As Saratoga’s longest running professional theatre company, both productions will feature several members of Actors’ Equity Association, the stage actors’ professional union. In addition, a talented group of non-union professional actors and members of Saratoga Shakespeare’s Young Theatre Professional Company will round out the casts. Performances of As You Like It are scheduled for July 17th – July 28th and performances for Henry IV are scheduled for July 31st – August 4th. Performances are all Tuesday through Saturday (there are no Sunday or Monday performances). The Company welcomes back director Liz Carlson-Guerin as director of As You Like It. Director of last year’s mesmerizing The Winter’s Tale, she is a director and dramaturge who specializes in new play development, classic theatre for contemporary audiences, physical and devised theatre and community engagement. She served as associate director and company member for West Philadelphia’s renowned Curio Theatre Company, and her 2016 Philadelphia premiere of The Birds by Conor MacPherson for Curio was Barrymore Award Recommended. She is the Associate Director of the Kenyon Review Playwrights Conference and a Visiting Assistant Professor of Theatre at Kenyon College. Saratoga Shakespeare also welcomes back Associate Artistic Director David Girard to direct Henry IV. Director of a wonderfully theatrical production of Romeo & Juliet for the company in 2016, he is the Artistic Director for the new Troy Foundry Theatre, and recently appeared in Capital Rep’s hit production of She Loves Me. He is on faculty at Siena College and Rowan University, and is currently appearing as a principal actor in the world premiere of the first full presentation of John Guare’s acclaimed Lydie Breeze Trilogy with EgoPo Theater in Philadelphia. Since 2000, the productions of Saratoga’s longest running professional theatre company have become a beloved Saratoga tradition, and many regional children have grown up watching Saratoga Shakespeare every summer. The Company takes pride in presenting Shakespeare’s work with great clarity and continues to develop a visually arresting and audience immersive aesthetic. The Saratoga Shakespeare Company is grateful to Skidmore College for their generosity, as well as continued support from Skidmore’s Office of Special Programs and the Department of Theater. The Company is a recipient of a 2018 Community Arts Grant from Saratoga Arts as well as an Alfred Z Solomon Grant. As an added attraction this year, Saratoga Shakespeare, SPAC and Saratoga ArtsFest will present Shakespeare in the Pines on the SPAC grounds. On Friday, July 20th at 12:30pm Saratoga ArtsFest presents Shall I Compare Thee to a Midsummer’s Dream, a festive afternoon of Shakespeare’s fairies, nymphs, sonnets and soliloquies created to enchant children of all ages. At 2:00pm that day the event culminates with a tented performance of the captivating, one-hour musical adaptation of Romeo and Juliet, directed by Saratoga Shakespeare’s Louis Butelli in association with Lincoln Center Education, presented by SPAC and Saratoga Shakespeare Co. in association with SaratogaArtsFest. For further information, visit Saratoga Shakespeare’s Facebook page at www.facebook.com/SaratogaShakespeare. You can also contact our Executive Director, Barbara Opitz, at 518-587-2166 (bopitz@skidmore.edu) or our Associate Artistic Director of PR and Audience Engagement, David Girard, at 518-528-1677 (david@davidmgirard.com).